New Facebook Lexicon has launched and gives significantly more insight than the original Facebook Lexicon. 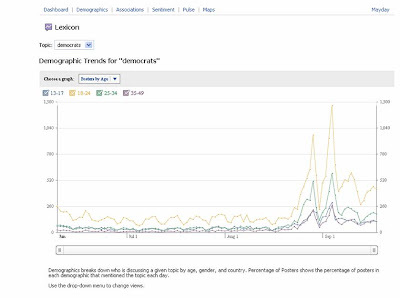 New Facebook Lexicon continues to analyse Facebook Wall Posts, but now offers the chance to analyse demographics, sentiment, 'pulse', location and associations. Demographics breaks down who is discussing a given topic by age, gender, and country. 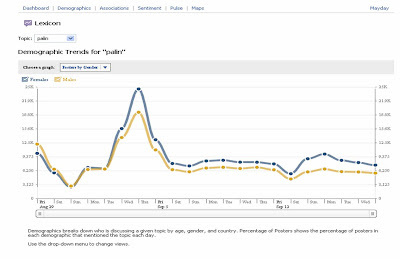 For the word 'Palin' the majority of Facebook posters are male and 18-24 - surprising? Sentiment shows the percentage of posts that are positive vs. negative about the topic. 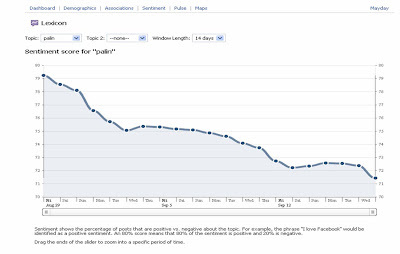 For 'Palin' the trend is to more negative sentiment as time has progressed. At the end of August sentiment was around 80% positive and 20% negative. New Facebook Lexicon shows this has now shifted with a drop in positive sentiment to 71% and a rise in negative sentiment to 29%. Associations plots terms that are frequently mentioned alongside the topic. The Y axis is the average age and the X axis is the average gender of users who posted the association. For example, a bubble up and to the left means that the association is more prevalent among older and more female users. A bubble down and to the right means that the association is more prevalent among younger and more male users. 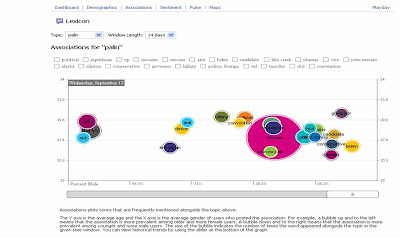 The size of the bubble indicates the number of times the word appeared alongside the topic in the given time window. 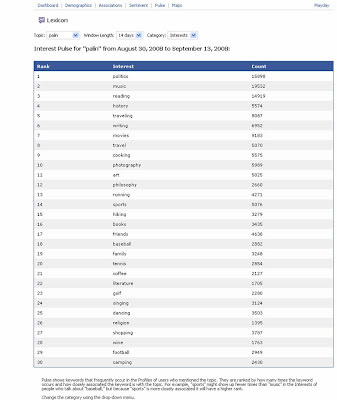 Pulse shows keywords that frequently occur in the Profiles of users who mentioned the topic. They are ranked by how many times the keyword occurs and how closely associated the keyword is with the topic. Maps shows where people are talking about the topic. The color of each area depends on how often the topic is mentioned. Darker colors indicate that more people in that region are posting about the topic per day. New York and California have the most posts including 'Palin', however if you look at the map in terms of percentage of users posting 'Palin' then Alaska is top. New Facebook Lexicon gives far more information than the original Lexicon. New Facebook Lexicon also shows that Facebook users writing wall posts using 'Palin' are mainly, young, male and live in New York or California. 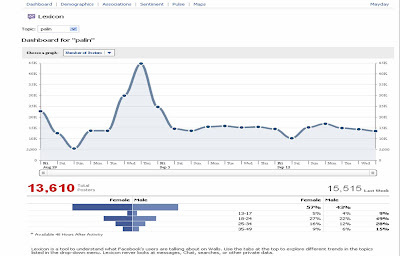 New Facebook Lexicon also shows that Sarah Palin's popularity is decreasing. Interesting insight and great program!